A digger was used to tear down the roof and side wall of the Lidl supermarket in Citywest. GARDAÍ HAVE ARRESTED nine people after serious incidents, including looting and car thefts, in west Dublin. Looting occurred at a Lidl supermarket in Citywest, while damage was also caused to a Centra store Jobstown. In an official statement this evening, gardaí said they deployed units to the Tallaght District following reports of burglary and theft of vehicles. “Substantial damage was caused to a supermarket on Fortunestown Lane and further damage to another premises in Jobstown,” it said in relation to the alleged looting. All those arrested are currently detained at Dublin Garda Stations. A large team of gardaí were deployed to Fortunestown Lane and Jobstown earlier this evening. A digger was purposefully used to gain access to the Lidl premises by ripping into the roof and side wall. Dramatic video footage of the incident has been uploaded online. There are also reports from locals that the digger was used in attempts to break open a safe taken from the store. A video taken by a passerby also shows people walking through the carpark of the Lidl store carrying boxes of goods. Dublin Fire Brigade sent three fire engines from Tallaght and Dolphin’s Barn to the scene, responding to reports that the building was on fire. However, it quickly left the scene as no fire was found. Both Centra and Lidl have confirmed incidents at their stores. It is understood that the Defence Forces personnel were requested to provide 6×6 vehicles to transport gardaí into the area. An incident room has been established at Tallaght Garda Station and anyone with information is asked to contact 01 666 6000 or the Garda Confidential Line on 1800 666 111 or any Garda Station. Sinn Féin South Dublin County Council Cathal King told TheJournal.ie that “the whole community is absolutely furious over this”. “Everyone has been in great spirits and everyone has been out with their kids, there has been great banter. There’s a tiny few that absolutely drag us down for this sickening behaviour. It’s absolutely disgusting behaviour,” King said. Lidl has confirmed that it is also responding to the incident at its store on Fortunestown Lane in Citywest, Dublin. A statement from the retailer said: “We are aware of the very serious incident at our Fortunestown Lane store this evening. As our store on Fortunestown Lane was closed when the incident occurred this evening, we can confirm no member has been injured. Here's a screenshot of a video taken at the scene when a digger drove into the building. All Lidl stores in Ireland were closed today due to the adverse weather conditions. 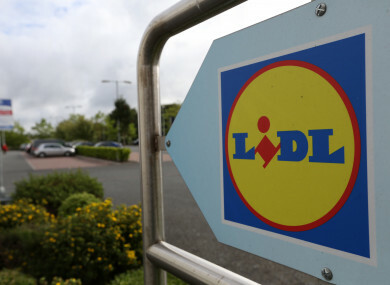 In a statement earlier today, Lidl said that regional management and its store teams were to make the decision on reopening this afternoon if it was safe to do so. The Lidl store in question did not open at all today. Email “Gardaí arrest nine people in Tallaght area of Dublin after looting of supermarket and car thefts”. Feedback on “Gardaí arrest nine people in Tallaght area of Dublin after looting of supermarket and car thefts”.